Lucy Burns was a versatile and pivotal figure within the National Woman’s Party (NWP). With distinctive flame-red hair that matched her personality and convictions, she was often characterized as a charmer and a firebrand–and the crucial support behind her friend Alice Paul’s higher-profile leadership. Born in Brooklyn, New York, to an Irish Catholic family, Burns was a brilliant student of language and linguistics. She studied at Vassar College and Yale University in the United States and at the University of Berlin in Germany (1906-8). While a student at Oxford College in Cambridge, England, Burns witnessed the militancy of the British suffrage movement. Burns set her academic goals aside and in 1909 became an activist with Emmeline and Christabel Pankhurst’s Women’s Social and Political Union (WSPU). She perfected the art of street speaking, was arrested repeatedly, and was imprisoned four times. From 1910 to 1912 she worked as a suffrage organizer in Scotland. Burns met Alice Paul in a London police station after both were arrested during a suffrage demonstration outside Parliament. Their alliance was powerful and long-lasting. Returning to the United States (Paul in 1910, Burns in 1912), the two women worked first with the National American Woman Suffrage Association (NAWSA) as leaders of its Congressional Committee. In April 1913 they founded the Congressional Union for Woman Suffrage (CU), which evolved into the NWP. Burns organized campaigns in the West (1914, 1916), served as NWP legislative chairman in Washington, D.C., and, beginning in April 1914, edited the organization’s weekly journal, The Suffragist. Burns was a driving force behind the picketing of President Woodrow Wilson’s administration in Washington, D.C., beginning in January 1917. Six months later, she and Dora Lewis–targeting the attention of visiting Russian envoys–attracted controversy by prominently displaying a banner outside the White House declaring that America was not a free democracy as long as women were denied the vote. When Burns participated in a similar action with Katharine Morey later the same month, they were arrested for obstructing traffic. The banners displeased President Wilson and escalated the administration’s response to the picketing. Burns was arrested and imprisoned six times. Declaring that suffragists were political prisoners, she was among those in the Occoquan Workhouse who instigated hunger strikes in October 1917 and were subsequently placed in solitary confinement. 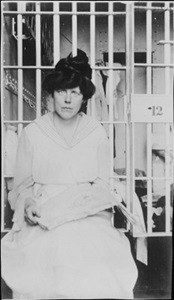 Jailed again when protesting the treatment of the imprisoned Alice Paul, Burns joined Paul and others in another round of Occoquan hunger strikes. Burns was in Occoquan for what became known as the “Night of Terror” on November 15, 1917, during which she was beaten and her arms were handcuffed above her head in her cell. Particularly brutal force-feeding soon followed. After her release, Burns commenced nationwide speaking tours. Unlike Paul, who remained active in the NWP until her death, Burns retired from public campaigns with the success of the 19th Amendment. She spent the rest of her life working with the Catholic Church.